The UK non-life insurance market is facing a range of significant challenges which will make 2012-2013 ‘difficult’ for companies, according to Standard & Poors ratings services. In its latest report on the market, S&P highlights key issues including the likelihood that reserve releases – recently the source of significant balance sheet strengthening – will ‘taper off’. “Insurers released the reserve surpluses written in the early 2000s between 2007-2011, and these did much to support headline technical results,” it said. 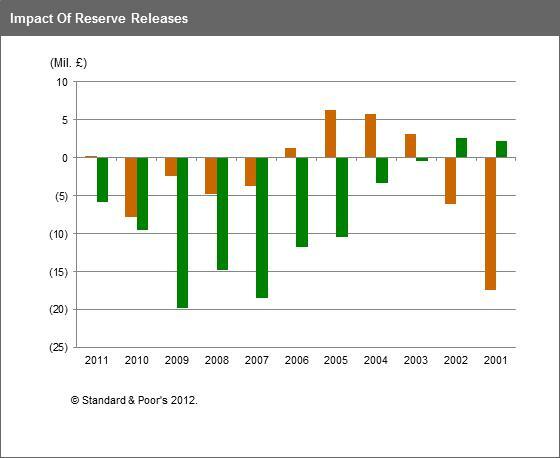 “In 2011, reserve releases were lower at £550 million than in 2010 (£1.1 billion) and 2009 (almost £2bn). The industry’s ability to generate revenue through continued price rises has also been questioned by S&P. It pointed out that in 2010-2011, rates rose significantly across the motor market, in response to years of rising bodily injury claims; these had caused the industry wide combined ratio to peak at 120% in 2009-2010. Through tariff increases, the sector succeeded in reducing its combined ratio to 106% in 2011. However, rate increases for personal motor in 2012 to date have been more modest, at an average 5%-6%. To give this context, they rose by 3%-4% in personal property and by 1%-4% in commercial lines. Given that claims costs continue to rise, we expect the average motor combined ratio to be 105% for 2012, and the non-life average to be around 98%. Elsewhere in the industry, S&P pointed out how a new agreement remains in the balance over how flood cover is provided beyond June 2013; legal changes in April 2013 will seek to counter claims inflation in motor bodily injury lines; referral fees are to be outlawed; and the Competition Commission has set up an enquiry into the motor insurance sector. The changes are potentially positive for insurers, but significant uncertainties remain.